The mountain Lake Bled attracts not only day visitors from Ljubljana, but also holiday makers in summer, while in the winter the resort offers skiing as well. 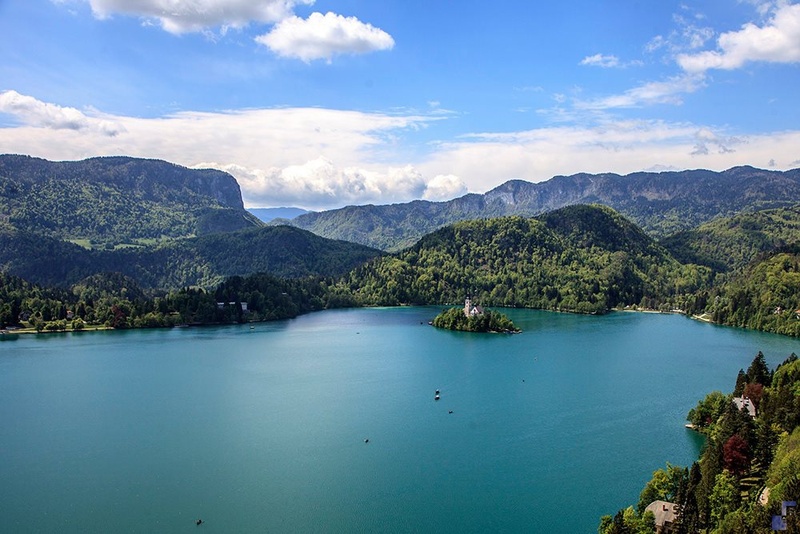 With exceptional lakeside locations overlooking the Lake, it is not accidental that former kings and presidents of former Yugoslavia have chosen Bled as their residence, which stood on the exact location of today's Vila Bled. We drive around the lake to the castle on the cliff above the lake. Per request you can also take a boat ride to the island in the middle of the lake with the traditional Bled boat called a pletna. The island has a church with a “wishing bell” and the legend says that anyone who rings the bell three times, will have his or her wish come true. Bled is well known for a vanilla-and-cream cake served as a local speciality. On request and depending on available time it is possible to arrange a visit of the Vintgar gorge or medieval town of Radovljica. Not far from lake Lake Bled, only 4 km away, the remarkable natural gorge of the river Radovna Blejski Vintgar was formed during the Ice Age by the same glacier that carved out the entire Bohinj Valley, Vintgar Gorge is one of the area’s hidden gems. You can walk along the picturesque gorge over wooden bridges and along galleries by the rushing river Radovna for 1600 m, at the end of which you will see the 26-metre waterfall Šum. On the way to Ljubljana, we can stop in the medieval town of Radovljica, where we can visit the 500-year-old House of Tradition Lectar and its shop. Here we recommend having a break for a traditional Slovenian lunch (depends on the available time). Optional supplements: Entrance to the castle with a wine cellar, an old print shop, museum and a chapel (11 € / person), pletna boat ride to the island in the middle of the lake (14 € / person), visit of the church with the “wishing bell” (6 € / person), visit to Blejski Vintgar gorge (4 € / person).